Why do all great things have to come to end? That was my thought this past year as a recurring quiet reflection because Linda and I never really wanted to talk about it. It made our last full-time year together hard for both of us because our eyes always watered up and we would try to find something easier to talk about knowing it was around the corner. We knew the day was approaching as we watched the looming date and the Signature calendar race by, as our precious days quickly disappeared like an hour glass with sand slipping through the narrowest point. 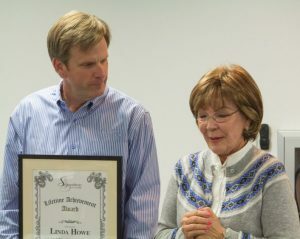 I have loved my partnership with Linda Howe since day one and consider it one of my greatest blessings, and hoped it would never end. I was her close friend and adopted family member; she was the Godmother to my daughter and the greatest recruiter LTC had ever seen – and she was my partner! One thing I learned in 1998 was if Linda Howe was your partner, you would never ever be alone because she was tenacious, elegant, fierce, generous and dedicated like no one I had ever seen. For many of our female leaders she embodied the consummate example of class and excellence because she crashed the glass ceiling from the “mad men” era with ease, when it was a truly rare event to be a female senior executive decades ago. But she made everything look easy while carrying any personal trials or tribulations with rock-solid faith, like God was always with her. How could she retire this young (told me she was the ‘new 50,’ but heck, who really knows, she was a recruiter) when the SHC revolution is just hitting stride? We just crossed midfield this week! For almost 15 years, I had it all really – a great friend to confide in, a partner to cry with when we buried our Moms a few years apart. We stood side by side in prayer at each other’s weddings. She was a prayer partner to go to all the Holy Week church services with and a forgiving, non-judgmental friend who I could vent to when I was scared or hurt, or had to pick my owns crosses when life gave me painful curve balls you never want to face in the first place. We traveled through 9/11 on the “Royal Care” purchase without watching a TV for two weeks in a hotel room to show the terrorists they could not stop the Revolution. From the dark days of PPS, when most chain organizations tanked in bankruptcies, it was a newly-decimated industry fighting for its life. We just went town to town, selling the dream of an LTC revolution when it was a brutal sell. We lived on the road for years, loaned money to Stakeholders, even drained our ATMs together to cover payroll in a prior company several times when we could not reach the owners. While I led our senior team through a 58-day bus trip, she dealt with a tragic resident passing a state away, and we talked daily. She won a union campaign as the best pinch-hit administrator, as a favor to me. With our teammates, we turned around 75 centers that were either falling apart from neglect, or on the watch list because of poor quality, or bankrupted by the previous owner. But we always showed up and worked the facility and the community one person at a time, promising a better day by restoring hope. We moved from Kentucky together in the beginning to build one team that took us from laughing stock and last place to a respectable top 20 in half a decade, and she landed the majority of those amazing leaders. We went through a sale of the prior company to the new Signature company that we all helped found and start anew with greater hopes the Revolution would finally happen. Three years ago, we moved the company 1,500 miles and rebuilt again with a team that may be the best I have ever seen assembled. We kept the heritage because we were grateful for all of our teammates but made discerning calls to raise the possibilities by building a rock star team. The sky is truly the limit, so today she can walk away from a 24/7 role knowing that the current SHC team will make us #1 in the country someday if God blesses our important work. What I will miss the most is everything – even the few million conversations over a decade and a half discussing the potential journey of a candidate together who was searching for a better journey. We just wanted to see inside of their hearts before we ever said yes. She will consult, advise and always be there for me and the Revolution. Our friendship will never be something we will ever take for granted, but it will be different. Sometimes the more we love something, the more it hurts when you can’t keep it 24/7 because God knows it’s time for Linda to nurture her grandchildren, return home to old friends, slow down and breathe a little. And I understand, but I sure don’t have to like it, do I? We wish Linda all the luck in the world and a heartfelt congratulations as the first recipient of the Lifetime Achievement Award in SHC history.